The project window is divided into two sections. The left pane deals with the session details and audio clip details. The Right side deals with the metadata, samplerate, etc. Scroll a bit to the right on the Right Pane until you see the Path Column. If you click on that, you will see a number (1) beside it. It means that the clips will be ordered based on the path where the clip is. Once you do that it is easy to see which clips in the session are in folders apart from the sessions audio folder. 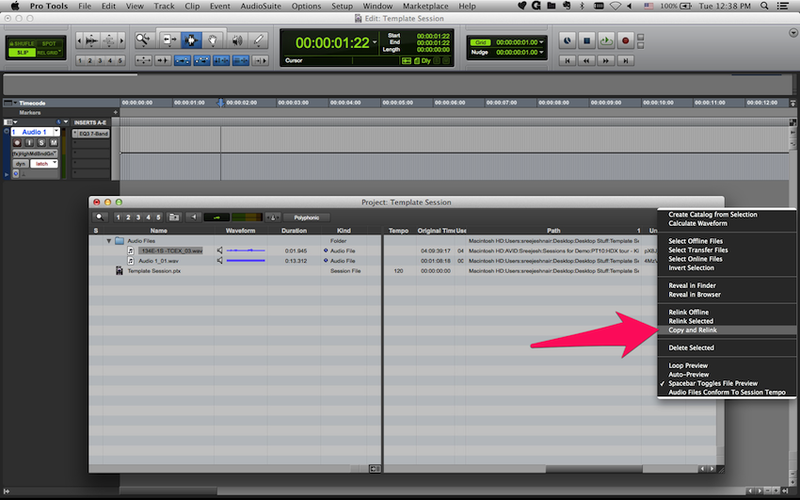 Select those clips which you need to import, go to the top right corner near the little triangle and click it. You will get a drop-down menu. From that select Copy and Relink and choose your audio folder.It copies and relinks all the audio you have selected and now you have a proper session with all audio in it.